Refresh your home with the zesty scent of citronella- the ultimate Summer fragrance.Box of 4 beautifully packaged, finely fragranced natural soy wax tealights.Each tea light is hand poured into an aluminium cup with a cotton wick.Total burn time per box of tealights is 24 hours. Box of 4 beautifully packaged, finely fragranced natural soy wax tealights. Each tea light is hand poured into an aluminium cup with a cotton wick. Total burn time per box of tealights is 24 hours. 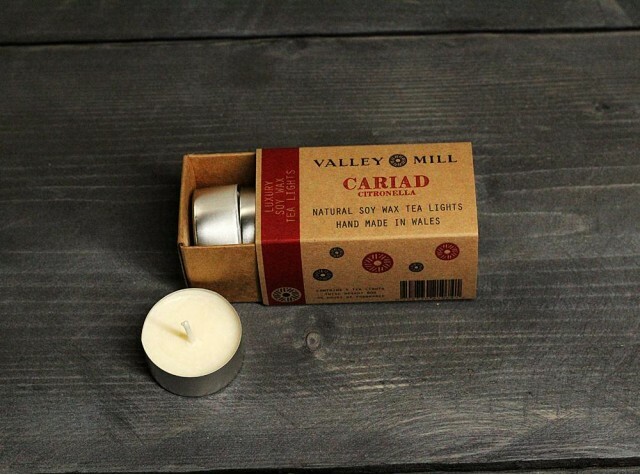 Natural Soy Wax with fragrance oils in metal tealight cases, packaged in a recyclable cardboard box. Never leave a candle unattended. Keep away from children, pets, draughts, vibrations & flammable materials. Trim wick to 3-5mm before lighting. Keep on a stable heat resistant surface. Do not touch or move whilst lit.